Even as a newborn, your baby will love staring at faces. When your baby is 9 to 12 months old, you can harness that fascination to develop several skills: eye-hand coordination, language, and listening skills, and imitation. Once a baby's vision begins to develop, they love to look at faces, even their own. Mirror games can help with their cognitive and physical development. You've probably already introduced your baby to mirrors, but a mirror toy is something they can explore on their own. 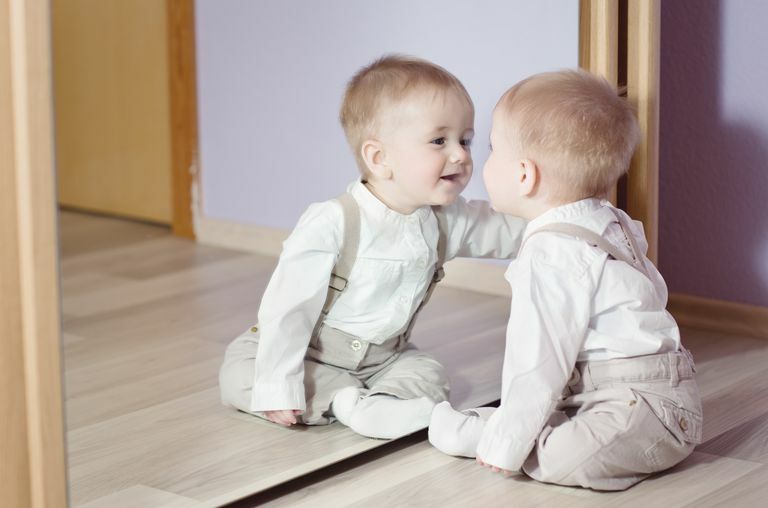 In addition to developing cognitive skills, mirrors help babies learn self-awareness. Here's a simple play activity that your baby is bound to love. Begin by locating an unbreakable mirror or a mirror that is safely and securely anchored. Position your baby in front of the mirror so that he can see both his reflection and your reflection. Ask your baby to point to his nose, hair, eyes, etc. If he needs help, you can point to your own nose or point to his nose until he grasps the concept. This exercise helps the baby learn the names of his body parts that he may not otherwise be able to see. Work on imitation skills, by making funny faces in the mirror and asking him to do the same (wrinkle nose, stick out tongue, widen eyes, etc). There are few things cuter than a baby who is trying to mimic you, and there are sure to be many giggles during this activity. Use favorite toys to perform sort of a "puppet show" in front of the mirror. Invite him to join you in the play, to see if he understands the relationship between himself and the mirror. Believe it or not, your baby won't realize that he's looking at his own reflection until somewhere around 9 months of age. To "test" to see if he's got the concept, unbeknownst to him place a small sticker or spot of lipstick on his face. When he sits in front of the mirror, if he tries to wipe it off his own face and not the face of the baby in the mirror then he has it all figured out. This is a pretty significant milestone for babies and will be fascinating to watch the realization dawn on him when he finally makes the connection. Another way to test whether the baby knows his reflection: while he is looking in the mirror, put a toy or stuffed animal behind him. If he tries to reach for the reflection rather than reach behind him to grab the toy, he still is not aware that he and his reflection are one and the same.